Sensors that tell growers how much water to use; drones that can fly over operations and assess the health of crops; real-time data at the fingertips of farmers. It’s not science fiction – it’s the future of agriculture. In an attempt to streamline operations, increase sustainability and improve climate resiliency, California farmers are embracing precision agriculture technology. Also known as “smart farming,” precision agriculture uses the latest technological innovations to produce more food while using less resources. But California farmers are not the only ones adopting this technology. Nearly 6000 miles away, farmers, academics and public officials in the country of Chile are also actively exploring opportunities in precision agriculture. As some of the world’s largest wine producers, Chile and California share a number of similarities. They both enjoy Mediterranean climate ecosystems. They bought have struggled with prolonged drought. And most importantly, both California and Chile are committed to implementing climate smart agricultural practices. 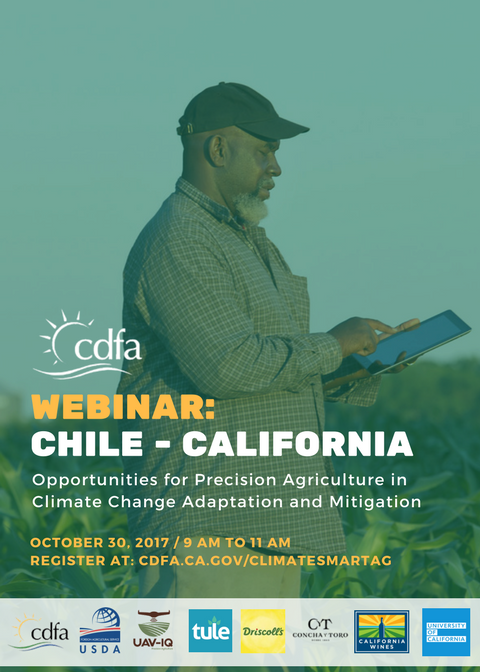 This free webinar brings together farmers, research scientists and government representatives from Chile and California to discuss the role precision technology can play in mitigating the impacts of climate change and improve on-farm efficiency. The event will be held on October 30th from 9 am to 11 am.